Today's card is all about a challenge to use a patterned paper that I do not like. I feel like this happens to all of us paper crafters, you get a pack of paper that you love, well, all but this one print. And you hope you like the other side of it. Well today I thought we'd figure out how to use that patterned paper that you do not love. These are my tips and tricks for turning your least loved paper into a WOW card, or a least a card you like. I have been known to have an aversion to yellow, specifically a dark mustard yellow. So, when I saw the mustard yellow heart pattern in the Follow Your Heart paper pack I was definitely put off. But I decided to take it on as a challenge. I was going to make a card that I liked using this paper. Here are the things I did to create a card with this paper that I liked. Tip One: Use an element on the card that you already love. With all the cards I have been making with this stamp set I have been playing around with different colors for the typewriter. So, I used my Wild Honey Distress Oxide ink pad to stamp and emboss the typewriter with clear embossing powder. Nothing makes you love a new stamp more than embossing it! And how cute is this typewriter in yellow! Tip Two: Use a technique that you love. And I knew if I used a technique that I loved doing I would also help me to create something I loved. So, I decided to create my own background and use the paper as a layer for this card. I found three shades of yellow in my Distress Oxide ink pad collection to make an ombre background. Using these three shades of yellow was a way of toning down the mustard yellow in a paper. After blending these three colors, light to dark on Bristol Smooth card stock I stamped over the top. Tip Three: Incorporate an oldie but a goodie. I stamped over the top with one of my all time favorite background stamps, Graduated Dots. I inked it up with the same three colors of distress oxide that I used for my ink blended background, in the same order, and stamped it on that background. Tip Four: Use a PIECE of the not my favorite paper, instead of covering your card with it. I pulled out a shape I created for my Sending My Love tutorial. It's resembles the shape of the paper coming out of the typewriter. I traced this on to the patterned paper and onto a piece of black card stock. I cut them out and layered them as a layer to mount my typewriter and other stamped images too. Tip Five: Bring in embellishments that coordinate. Right now I am in love with the embellishment pack from FSJ called, All The Things. Honestly, have the reason I love them is the name! But this pack has a great variety of colors and it comes with gems and sequins! And guess what it has great yellow gems. So I added three of them to give the card a little something special. If I had to put all my tips into one, I'd say is was to pair that ugly duckling paper with things you already love. And that is where the Black Licorice silk came into play. For one, I love the silks by FSJ and two, I love the Black Licorice silk. I thought on this card it would look like spilt ink. So, the moral of this story is, take on the challenge of PLAYING. Take that funky paper and just play with it by bringing in stamps, techniques and elements that you love. You will surprise yourself and have fun. In the end, you might just have a card you love. So, did I love the card I ended up with. I think I do! I love the cute out typewriter letters saying "note" on the typewriter paper. I love the look of the spilt ink and that background is all kinds of right! I played with shades of yellow that I do like so not to focus on the mustard. And the result is definitely a card I am happy with. You can watch the making of this card in the video below, my facebook live from last night, In the video you can check out the other version of this card, where I sponged the edges of the patterned paper. Let me know which one you like better. If you are interested in the Sending My Love Tutorial you can find it HERE. And if you are interested in the supplies I used to make this card you can scroll to the bottom of this post where I have linked them for you. Affiliate links have been used at no cost to you. Thank you for your support. I love that you come visit my blog and let me share my creations with you. I have to admit I am not ready to say this, but it is time for a lot of us to start thinking about school! As a homeschooling mom I LOVE my summer break! Of course we still do math, but the more relaxed days with trips to the pool and hanging out with friends.... I could get use to that. Wait, I am use to it and am joining to enjoy every last minute of it. But when school starts maybe you like to start the year off with something special for the new teacher. It's nice to let them know they have our support and we appreciate what they do for our kids. As a teacher myself I know these little gestures go a long way. We attend a Co-Op school once a week and I like to gift little things to the other teachers in my kids life. So, when FSJ asked me to demonstrate the Thanks Teacher ATS stamp set at convention last month I knew I would be able to make somethings I would actually use. The cute little images in these projects are from the Thanks Teacher ATS stamp set, it is only $8.95 but has 8 stamps in the set. SUCH A DEAL! Here you can see me on main stage at the FSJ convention demonstrating these projects for my fellow Journey Coaches this past June. I LOVED every minute of it! Now let's take a close up look at each of these projects. This pen holder would make a great first day of school gift. It is made using the Card Carrier Bag (DI-0386). Just cut one bag piece, fold it in half, cut off one half of the bottom flap, fold it over and glue it into place. This pen holder is made out of Whip Cream card stock and stamped with the new background stamp, Grid Paper. This next project is a card that holds a post it note pad. This style of card is call a Match Book. There is a flap at the bottom of the card that folds up, it is then stapled into place and covered with printed paper to hide the staple. The card front, which is scored in two places to accommodate with post it note pad, tucks into this front flap. Just like a box of matches. TIP: Want to make your "grade book" image have the feel of a composition book? Ink the stamp with an embossing ink, like Clear Pigment Ink, and emboss it with white powder. After you cut out the image, splatter it with Whip Cream Silk, covering it liberally. This last project would be a great gift to work on through out the year and gift it to the teacher on the last day of school. It's made with the Notebook Easel. Which has 65 pages of white paper in it. My idea with this book is to add a pictures of each student to it's own page. Have the kids write a little note next to the picture just for their teacher. Then at the end of the year she has a special keepsake to remember that years class. I also thought it would be nice to break it up a bit and add a few fun pages that are cute and inspirational. And it is so easy to add a page to this notebook using the new Spiral Notebook Die (DI-0455), made just for this cute little book. If you scroll up you can see that I also used it to make a fun layer for the card. I used the die to cut a page for my book from the Through The Year Printed Paper Pack. And on each of my "landing pages" I also used the ADORABLE, Baby Envelope Die (DI-0410). If you have any questions about these projects, please let me know. Not only do I love sharing my love of creating with paper with you, but I love helping you with your creations too. Thank you for letting me share these projects with you! FREE Tutorial Bundle, just for shopping at my online store! I have a cute little pocket card to share with you today. This is the card I am making and sending out to all my customers with their NEW 2017-2018 Catalog! Keep reading to find out how to get your own (or scroll to the bottom). I wanted to make a pocket card, because I am including a coupon in each card. Here is the Note Pocket Die (DI-0025) that I used to make this card. It fits nicely on a half sheet of card stock (5-1/2" x 8-1/2") with a bit of card stock left over you could save and use for something small. I used two stamp sets to make this card, the Lovely Day ATS (AT-0188) and the Canvas Prints Stamp (SS-0019). To bring my flowers to life I used my Color Burst Pencils (JM-077) to color the centers and stems of the flowers. I wanted to match this to my card stock and ink color, Sweet Pear, and with the Color Burst Pencils, you have what you need to match all the FSJ colors. With 48 pencils in the tin, you get tints and shades of numerous colors. This allows you to shade, blend and do ombre effects. It also means that if there is not one pencil to match your specific color, there are two you can blend together to make that color. In this case, I used Pencils 16 and 21 to make Sweet Pear! I also added some shimmer to my flower by painting on some Sparkle Silk (IP-0126), look at those petals! I thought you might like to SEE how I made this card, see me die cut the Note Pocket. Watch how I create the Sweet Pear with my Color Burst Pencils and experience the flower coming to life with the Sparkle Silk. Here is my video demonstrating all these fun things for you. If you would like your VERY OWN copy of the new 2017-2018 catalog you can order one with the BUY NOW button below for the discounted price of $10 and I will happily send it to you with this cute card! You can find all the things I used on this card in my online store. When you are there be sure to check out the CLEARANCE RACK and the BREAK UP SALE. Have you ever thought about being a professional stamper, getting paid for doing what you love? Or maybe you would like a discount on your supplies for your paper crafting hobby? I encourage you to consider Fun Stampers Journey. As a Journey Coach you need only turn in $150 in orders a quarter, the lowest minimums in the industry. Making it easy for you to join as a hobbiest or build a business doing what you love. To find out more information about joining my team, visit the JOIN MY TEAM page, link at the top of the page. I have been busy lately working on a set of 40 Thank you cards for a wedding gift for a friend who recently got married. If you are a card maker Thank You cards for any occasion make a great gift; baby shower, bridal shower, birthday, wedding, etc. You may remember my recent trip to the Oregon Coast? That is the place where this friend got married. And so, these cards are inspired by the ocean. To make the background you need watercolor paper. That is very important, because in order to get the ink to spread out, bleed over the surface of the paper, you need a thicker paper than card stock. First prepare your inks. I used Mint Melody, Pool Party and Lost Lagoon inks. I opened up these stamp pads, so that the lid was available and dropped in 4-5 drops matching ink. Then with my paint brush I mixed in a little water. Once the inks are ready, you need to get your watercolor paper ready. Spritz the water color paper with water to wet it. Then pick up one color of ink with your paint brush. Paint in a zig zag wash or in more of a dot dot dot, play with it and see what you like. Wipe up the puddle in the lid of the pad before closing it. Repeat this with the second and third color. Let this DRY, like really dry, come back tomorrow dry. OR, you can speed things along with your heat tool. Once it is dry use the embossing buddy to coat the entire surface of the paper. Then stamp on your image/ saying with Whisper White or Versamark ink and emboss with White Embossing powder. Lastly splatter on some more of your prepare ink. Let this dry and mount it to a card front, mine is Lost Lagoon. Let me know if you have any questions on my Watercolor card. Today I have a quick video for you, sharing how to store your photopolymer stamps. I just learned about this and was in love with this great idea, so I shot a quick video for you on my phone. I'm excited to share with you my first video featuring ME here on my blog. I hope to do more, so let me know what you think and I will work on some stamping videos! Here's what your case looks like when you have all the stamps put down and the plastic sheets over the top. I'm sure youre running for your stamp sets just as I did! Visit my website to view our new catalogs and shop when you are ready. I'm excited to be sharing this card with you. A card I created for a workshop I have on Saturday with a good friend (hi Christy!). I love these colors for fall. They are so calming. In my book, you can not go wrong with Crumb Cake!!! I used the Merry Everything Stamp Set and the Fall Fest Stamp set for this card. But, my favorite part is the background! Which I made using the leaves from the Fun Fall Framelits to create my own stencil! Then I sponged the stencil over the Crumb Cake card stock with Whisper White ink. So pretty! Can't wait for Saturday, it's going to be a fun workshop. I have more dates available for workshops in October and November, leave me a comment if you want more information. We seem to be in a flight pattern for hot air balloons, they go by our house regularly an at times close enough to shout a hello to the riders. It's very fun for the kids, and the parents! The Pennants are from the new Perfect Pennants Die (#123126, available July 1st). The pennants on this die are the perfect size! When you make a long banner it is not to big! This banner measures 28" from flag to flag. The Flag is from the Summer Mini Catalog, it's called "Land of the Free" (#123100). It is one of my favorite 4th of July stamps in a long time. And I like that it is a single stamp. All the letters are die cut with the Alphabet Simple Letters (#115960) for the Big Shot (#113439). The stars are made with a retired star punch. All the stars and the letters are inked with Versamark (#102283) and embossed with Iridescent Ice powder (#101930). The smaller pennant has a scalloped edge that I made with the Dotted Scallop Ribbon Border Punch (#119275). My favorite detail is the Cherry Cobbler Baker's Twine (#123125) on each star!!! Are you wondering how I made the background on my pennant? It is super easy!!! Do you have extra wood blocks left over from stamps you clear mounted? I do and then I saw something on the blog Cut Out + Keep that finally gave me and idea on how to use them! I have to share it with you! Take a wooden block and and length of yarn. Tape one end to the block, wrap the yarn around the block and tape the end to the block again. Ink it and stamp it! When you want to use another color use the other side of the block. When you want to use yet another color, take the yarn off and put on a fresh piece. LOVE the string! And how about stamping it again to make it crosshatch! Okay, what about rubber bands?!? FUN!!! On the second square I kept stamping the rubber band block over and over until I ran out of ink. For the banner I used the block with strings on it. I love this look and will be using it more often, it's super fun! To order the products used here click the badge below to shop. I heard from a few of my blog fans that they missed my posts! Oh, that is so nice! So, I am here today to show you one of the father's day cards I made with my club. Step 1: Stamp the globe from The Open Sea Stamp Set (#123032) with Versamark Ink on Watercolor paper in the upper left hand corner, emboss it with clear powder. Step 2: Take your Clear "E" block (#114484) and ink that with Sahara Sand ink all over, then in spots ink it again with Early Espresso ink. Then spritz that with water from a spray bottle, enough times to blur the inks. Stamp this down right over the top of your water color paper, my paper was the same size as block "E". This is what gives it the splotchy tea stain look, you could use the inks from the distressing kit. Step 3: Once the paper is dryish, ink the "captain's log" image from The Open Sea Stamp Set with Early Espresso ink, stamp it off once on your scratch paper and then on the water color paper, on the right hand side. Do the same with the compass image in the lower left hand corner. Step 4: Ink your ship image with Not Quite Navy Ink, then thump the brush tip of an Early Espresso Marker over the top of that. Spritz this lightly with water and then stamp in the lower right hand corner of the water color paper, leaving enough room for your Baker's Twine (#123124). I used this same technique for the Happy Father's Day saying. Which was a hostess stamp set from the last mini catalog and is no longer available. Note: If you want your globe to "pop" a little more, you can burnish it with a sponge. Load your sponge up with Early Espresso ink and rub the sponge over the top of the embossed image in a circular motion, burnishing the ink into the paper. Then rub off any ink that is on top of the embossed image. It is pretty fun! Here is the card that I made at Britiney's club when I learned this very artistic technique. The stamps used here are: Just Believe (#120453), Wood Grain Background (#117100), Charming (#116519) (for the script background, this is the image that is embossed on this card) and Tiny Tags (#118592). You have to give this technique a try it is lots of fun and it comes out different and unique each time. You will love it. To purchase the supplies used in these cards, shop the clearance rack, and see all that Stampin' Up! has to offer just click the Shop On-Line badge below. I saw this awesome idea at convention. Alter and create your own Designer Paper with the Big Shot. This piece orginially came from the Bella Rose collection. I used the negative piece after cutting out the Tulipe Bigz Die as a template and stippled the design right on the paper. I used a stipple brush and Chocolate Chip Classic Ink. Isn't it GORGEOUS! I can not decide what to do with it. It is so pretty, I have to stare at it a while longer before cutting it up! My downline Georgie said it would make a great scrapbook page! Then you do not have to cut it up. At convention they also showed us how to use this same idea to create a template to stipple the design on your walls. They used a plastic window sheet in that case, something more sturdy and washable. If you do not have a stipple brush, or for a different effect try this with a sponge! I like the stipple brush it gives it a kind of airbrush feel. Okay, off to put in a load of laundry and STAMP while both girls are napping, Mommy got in a little nap too! For all of you out there worrying about me! I got the GREATEST idea while at SU! Regional Seminar in Portland and I wanted to share it with you! In the photo you can see that I have mounted a set of stamps on Domino's! The set is "So Many Sayings". It is a Level 1 hostess set that is actually a set of 3 stamps. Each stamp has a collections of saying on it. When you stamp it you get the entire set of sayings stamped at once. You can then cut or punch out the saying that you want. Or, color the saying that you want with a marker and then stamp it. 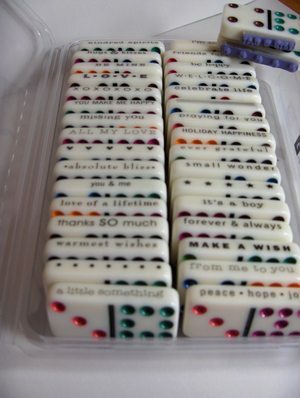 HOWEVER, Linda Hansen showed us this idea, to cut each saying or image apart and mount it on the long side of a domino! HOW COOL! You will then have to cut the stickers apart as well and mount them on the opposite side of the domino! Now it is a set of 34 stamps! And, they fit perfectly in the stamp case they came in! I came home and did this as soon as I got my So Many Sayings set! I am sure after seeing this you all want your own So Many Sayings Set, FOR FREE! All you need to do to get your own, FOR FREE is to place a $150 stamp order! In addition to your free set you will get $15 in free Stampin' Up! Merchandise! Don't feel like you can order $150 right now? If you ask a hand full of friends if they would like to order, I know you would have $150 in orders in no time. PLUS, here is my gift to you, when you get your So Many Sayings set and Domino's, bring them to me and I will cut and mount them for you! This will save you lots of time and then your set will be ready to go! Call or email me so that I can assist with your order. With the variety of sayings and style in this set you will have sayings to go with most of your cards and even scrapbook pages!